Hearthstone patch 5.0, otherwise known as the Whispers of the Old Gods patch, has gone live ahead of the set’s official release date on April 26th and 27th. While it doesn’t let you play with or acquire the new cards, it does apply the long awaited series of nerfs to the base set and add a number of new features. They range from the cosmetic, like the new ‘Wow’ emote seen above replacing ‘Sorry’, to the more gameplay affecting, with Arena runs now only rewarding packs from the most recent set rather than a random one. The official patch notes, and some undocumented changes, below. Prepare for the new world with the complete Whispers of the Old Gods card list. New deck recipes have been added for the standard format and Whispers of the Old Gods cards. Card back rewards for the next three months of ranked play have been added. They’re based on the Shadowmoon Valley, Zul’Drak and Halfhill zones of World of Warcraft. Arena runs now always reward one pack of the most recent set, and are slightly more likely to reward one pack of another standard set. 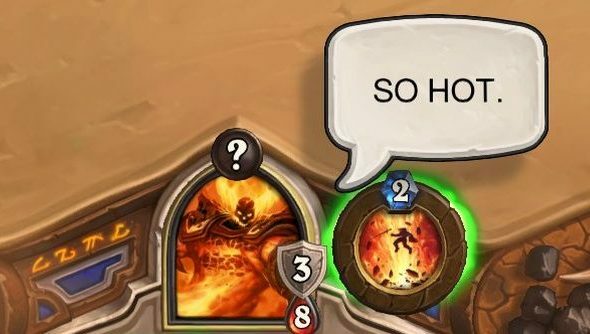 The “Sorry” emote has been replaced with a new “Wow” emote, the best patch note ever put into a videogame since World of Warcraft’s screenshot format change. The Hearthstone nerfs have gone live. You can disenchant these cards for their full value and we’d recommend doing so. Gameplay bugs, AI problems, audio, graphical and UI issues have all been resolved, though aren’t listed individually. On that last, some confused Reddit posters (where our header image is also taken from) have noted that some of these changes are fairly massive. One that affects how Mad Scientist and Mirror Entity interact is mentioned here, and is a big alteration to Hearthstone’s game logic. There are some saying it’s a bug, though I personally hope not because I always thought it was an unintuitive and illogical interaction in the first place. You can also now purchase packs of Whispers of the Old Gods in the store, and have a look at them all in-game using the collection browser. This allows you to read flavour text, which is always excellent, and see the golden versions of all the cards. Meanwhile, datamining has revealed some some upcoming Tavern Brawl art and mechanics that reduce the cost of all Legendary minions. It also looks like the co-op Mechazod Brawl will be making a return soon. More info on that over at Hearthpwn.